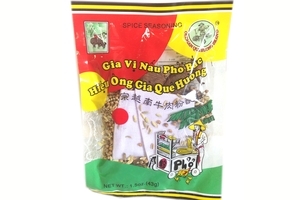 Oldman Que Huang Spice Seasoning (Gia Vi Pho Bac) in 1.5oz (43g) pack. Product of China. anise seed, cinnamon, fructus amomi, fennel seed, clove, coriander seed.